Whether your trying to conceive, or are currently pregnant, our nourishing Mum-2-Be supplements care for you and your baby. 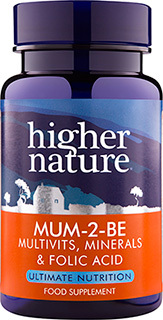 Carefully formulated with a blend of natural vitamins and minerals, including folic acid, zinc, iron and B vitamins, Mum-2-Be can be taken to support conception and pregnancy. Featuring highly absorbable vitamins with a focus on quality ingredients, they’re ideal for your fertility needs. 7.5µg Vitamin D (300iu), 60mg a-TE Vitamin E (90iu), 322mg Vitamin C, 50mg Thiamin (Vitamin B1), 50mg Riboflavin (Vitamin B2), 90mg NE Niacin (Vitamin B3), 9.9mg Vitamin B6, 405µg Folic acid, 15µg Vitamin B12, 75µg Biotin, 75mg Pantothenic acid (Vitamin B5), 519mg Calcium, 5mg Iron, 225mg Magnesium, 15mg Zinc, 45µg Iodine, 45µg Selenium, 3.9mg Manganese, 45µg Chromium, 90µg Vitamin K, 4.5mg Beta Carotene, 1.5mg Boron, 30mg Choline, 30mg Inositol,75µg Copper. -- No added: Salt, wheat, gluten, lactose, dairy products, artificial preservatives, colours or flavourings. Pregnant women take 3 tablets a day. 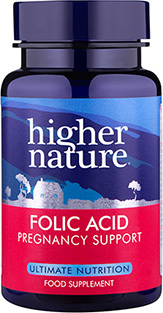 This level of folic acid should only be taken for short periods, unless pregnant or planning pregnancy. May not be suitable for people with a fish or crustacean allergy. 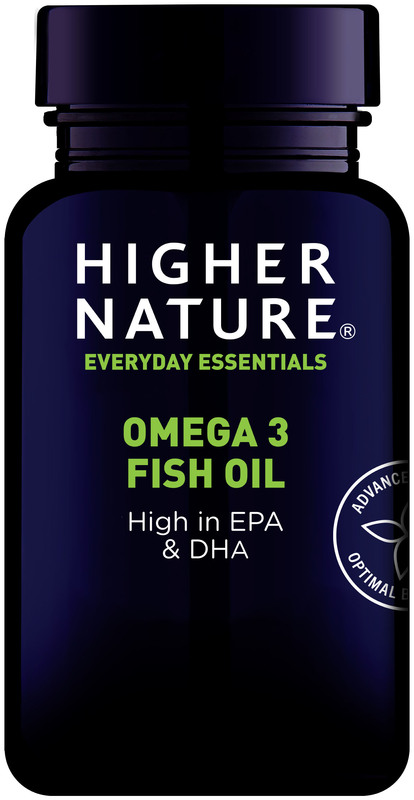 These compare quite favourably to the market leader for prenatal vitamins in terms of content, however be warned that you need to take 3 per day, so they are pricey per unit. I'm taking them in advance of pregnancy and finding it a challenge to neck all 3 as they taste pretty vile and are big. Expect it would be harder on an early pregnancy stomach.